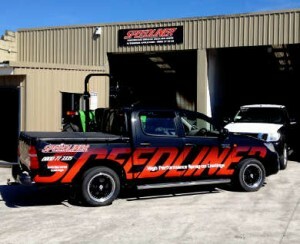 Speedliner® is a spray-on ute deck liner system manufactured by industrial polymers Inc. of Texas USA. Industrial Polymers is a company that develops & custom manufactures urethane polymer products. They have been producing Speedliner® in its current mix since 1994. Previously they produced a product called RL-2000 which is identical to other urethane spray products but they were unhappy with the long term results. It was after this, they started producing a better quality and more expensive product called Speedliner® . Industrial Polymers is a privately held Texas Corporation, first incorporated in 1982 with their headquarters in Houston, Texas. They currently have almost 3000 Speedliner® dealers in Twenty countries around the world. Speedliner® provides a durable layer of protection between your ute deck and cargo. It restores the appearance of your ute deck by covering scratched and damaged paint. Speedliner® can also be used to cover and repair other types of spray-on deck liners. Speedliner® offers a variety of high-quality automotive colour’s to complement or contrast the colour of your ute. Choose one of the standard colour’s or create your own custom colour. Ask your Speedliner® distributor for details. Speedliner® HC is another variance of Speedliner® which we now have available. HC stands for Hygiene Coating and is for use as an anti-bacterial coating for food vans and in factories and vet clinics etc. It has been approved for use in the dairy and meat industry. Speedliner® offers the most UV protection available. This means your vehicle’s deck will keep its quality colour over time. Speedliner® can utilise the high tech fiber of Kevlar® to make it stronger than ever. The same fiber our military uses to manufacture bullet resistant vests and armoured vehicles we use to provide extraordinary tensile strength (4,200 psi) and tear strength (610 lbs./in.). You can work your ute harder without damage with Speedliner® KE-2000. Ask your dealer for details. Speedliner®’s unique textured surface keeps your cargo from slipping, and you’ll have the satisfaction of knowing that Speedliner®’s non-slip surface prevents damage to both your ute’s deck and its contents. The Air-tight, contour fit permanently seals and guards your ute’s deck from dirt, water and chemicals that cause rust and corrosion under drop-in deck plastic liners. Speedliner®, quietens rattles and squeaks by dampening vibrations originating from the deck of the truck. This gives the driver and passengers a quieter ride.